This guide may contain spoilers about how rebuilding Hytbold works. If you'd prefer to figure this out on your own, you should stop reading now. Credits: This information in this guide was gathered by many dedicated Riders of Rohan beta testers, supplemented by Hytbold's chief architect at Turbine jwbarry, and made possible with the patient assistance of Turbine's fantastic QA team. As with any aspect of an online game, these details may change over time, so your feedback is greatly appreciated, too! Special Note: Lunasa has also compiled most of this information in spreadsheet format. See the post below for a link. Galuhad has written a Lua plugin to help you keep track of your progress rebuilding Hytbold on multiple characters. 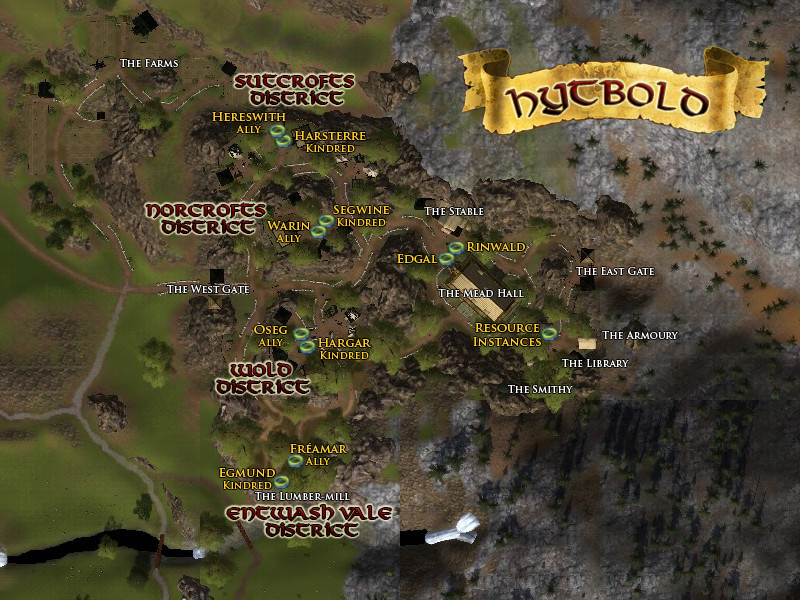 You can find out more about Hytbold Assistant at the LOTRO Interface site. Reach level 84 and do the quests To Hytbold (in your mailbox) and Welcome to Hytbold. Do the quest Aiding the Eastemnet and five of its related quests every day to earn [Tokens of Hytbold] and raise your reputation standing. Start rebuilding Hytbold and barter for your class's armour sets with the [Tokens of Hytbold] you earned (see the summaries below). (Optional) Do the crafting resource instances. (Optional) Complete deeds and barter for housing decorations. (Optional) Finish rebuilding Hytbold, experience the end of the Eastemnet's story, and barter for class armour sets for your alts. (Optional) If you're still doing dailies at this point, you can exchange your extra [Tokens of Hytbold] for [Silver Tokens of the Riddermark] on a 1 : 1 basis at any Eastemnet Miscellany Quartermaster. Last edited by Fredelas; Feb 04 2017 at 10:13 PM. Hytbold is a new kind of max-level activity introduced with the Riders of Rohan expansion. Your character's goal is to help rebuild the town of Hytbold through your efforts in the rest of Eastern Rohan. You can visit Hytbold at any time. It's located in the northeastern part of the Sutcrofts. If you go there before you begin rebuilding, you'll find the town completely deserted and destroyed. This is a good time to point out that Hytbold will look different to every player rebuilding it. You may see other players interacting with objects or NPCs that aren't visible to you yet. Shortly after reaching level 84, your character will receive a letter in the mail from Fastred to enlist your efforts. An attached item will bestow the quest To Hytbold, in which you're sent to Edgal. When you get there, Edgal will bestow another quest, Welcome to Hytbold, that has you visit the town's four districts (named after the four ridings of the Eastemnet) and some of its major buildings. You'll be rewarded [25 Tokens of Hytbold] after this brief tour. At this point, Edgal will ask all players to continue with the quest The Mead Hall: Rebuild, which conveniently requires [25 Tokens of Hytbold] to complete. This will be your first taste of how phasing works in the town. You'll notice that the appearance of Mead Hall has improved dramatically, at least on the outside. A few new NPCs will be visible to you now, too. If you take a walk around the Mead Hall, you should find 3 barter vendors with your class's icon overhead. Each of them sells a set of 6 pieces of armour intended to work well with one of your class's trait lines. You'll see that helms and jackets each cost [20 Tokens of Hytbold] while the remaining pieces cost [10 Tokens of Hytbold] each. Barter vendors for other classes will only become visible only after you completely rebuild Hytbold. The class armour sets bind to account, so you can use shared storage to give them to your alts. However, before you can barter for an item, you must first rebuild a specific part of Hytbold. Completing the quests to rebuild Hytbold also uses additional [Tokens of Hytbold]. If you select an item in the barter panel, then hover your mouse over the Barter button at the bottom, a tooltip will tell you which quest you need to complete. Most of these quests won't be available to you until you reach a specific (unmentioned) level of reputation and complete other (unmentioned) prerequisite quests. This guide will help you figure that part out. If you're only interested in armour sets for your own class, you can find a summary of which factions to focus on and which rebuilding quests to complete further down in this guide. In order to earn [Tokens of Hytbold], you'll have to do a lot of daily quests. Those are explained following the map in the next post. Last edited by Fredelas; Feb 04 2017 at 06:57 PM. This map provides an overview of the four districts of Hytbold, some of the major buildings, and quest bestowers for each reputation faction. Last edited by Fredelas; Oct 19 2012 at 11:03 AM. In order to rebuild Hytbold, you'll need to earn many [Tokens of Hytbold] by completing daily quests elsewhere in Eastern Rohan. These tokens are bound to your character, so when you earn them, spend them wisely. Once a day, you can get the quest Aiding the Eastemnet from Rinwald outside the Mead Hall in Hytbold. This allows you to complete five daily quests in Eastern Rohan, each of which rewards [10 Tokens of Hytbold], for a total of [50 Tokens of Hytbold] each day. Be sure to finish your five chosen daily quests before 3:00 AM /servertime (U.S. Eastern Time), or you won't be able to pick the quest up again the following day when you finish it. You can choose your five daily quests from sixteen quests randomly available each day. There are four quests each in the main settlements of the four areas: Harwick, Cliving, Eaworth, and Snowbourn. Completing a daily quest will also reward you with 1200 reputation for that area's faction. Beginning with Update 10, players can reset the cooldown on the quest Aiding the Eastemnet at a cost of [5 Mithril Coins] which can be purchased from the LOTRO Store. However, the cooldowns on the sixteen quests randomly available each day cannot be reset. By repeatedly resetting the cooldown on Aiding the Eastemnet, it is possible for a player to complete as many as 16 quests each day, earning [160 Tokens of Hytbold] total (although for practical purposes, most players will only want to complete 15 quests). Men of the Wold: Friend at 18,100 / 25,000 toward Ally. Men of the Norcrofts: Friend at 18,700 / 25,000 toward Ally. Note: The quest  Speaking the Truth rewards no reputation, while its alternative  Inhild's Wish rewards 900 reputation. It may also be possible to get a little more reputation if you complete the quest  Leader of the Nink-hai or its alternative  The Prisoner Returns. I'm not sure if they both reward the same reputation. Men of the Entwash Vale: Friend at 18,800 / 25,000 toward Ally. Men of the Sutcrofts: Friend at 19,700 / 25,000 toward Ally. This means to reach Kindred standing with every faction, you'll need a total of 144,700 reputation. It will take a minimum of 25 days to do this, assuming you do five quests for Aiding the Eastemnet each day and don't "waste" any reputation on factions that are already at Kindred standing. You can earn a little extra reputation by defeating warbands and doing a few other daily quests in most areas. If you find yourself with extra tokens and a shortage of reputation, you can also barter [5 Tokens of Hytbold] for 1200 reputation with any of the four factions from Rinwald, outside the Mead Hall. If you complete all of an area's daily quests at least once, you'll finish a deed that rewards an extra [25 Tokens of Hytbold]. Completing all four areas' deeds will earn you an additional [25 Tokens of Hytbold]. So even if you find a particular quest challenging, try to complete it at least once for these 125 bonus tokens. These are walled-off sections of Eastern Rohan where you will only face level 85 mounted opponents. The same quest is available in each area every day. You can enter them by talking to the quest bestower, and leave via a special return horse (shown on the map) or by right-clicking your portrait and choosing Leave Instance. Enemies respawn very quickly in the mounted combat instances, so be careful where you're riding. These are quests you actually perform in or near the settlement. One landscape quest is randomly available in each settlement daily. The quests in Harwick are playful, those in Cliving involve your war-steed, in Eaworth you'll be running and jumping, and in Snowbourn all the landscape quests involve fishing. If you don't yet have the fishing hobby, you can train it directly from the quest bestower in Snowbourn. Each area has one random public instance with two quests daily. One of the quests will involve defeating 10 enemies, and the other has you perform some related duties in the instance. If you intend to do both, be sure to get both quests from the bestower before you start. You must enter the instance directly from the quest bestower, and leave through an exit or by right-clicking your portrait. The opponents in these public instances are sometimes more challenging than they appear, so feel free to take a friend. You can use your war-steed in a few of these instances too, so experiment with what works best. In the defence and siege quests, if an NPC guard hits an opponent, you will not get quest credit for it, despite the enemies being indicated for open-tapping. You can stay in the mounted combat and public quest instances as long as you don't leave and complete their quests. Some of them are especially good for completing slayer deeds. Each quest rewards [10 Tokens of Hytbold] and 1200 reputation with the Men of the Wold faction. As of Update 10, this quest only rewards 700 reputation. This bug may be fixed in a future patch. Each quest rewards [10 Tokens of Hytbold] and 1200 reputation with the Men of the Norcrofts faction. Dressage: perform 5 mounted emotes demonstrated by the Rohirrim. Each quest rewards [10 Tokens of Hytbold] and 1200 reputation with the Men of the Entwash Vale faction. Each quest rewards [10 Tokens of Hytbold] and 1200 reputation with the Men of the Sutcrofts faction. This quest only rewards 700 reputation. This bug may be fixed in a future patch. Last edited by Fredelas; Feb 04 2017 at 09:02 PM. Once you've earned some [Tokens of Hytbold], you'll want to begin rebuilding portions of the town. There are a total of 162 quests to rebuild Hytbold. That's a lot of quests, but you don't have to do them all. Quests to rebuild Hytbold are linked together through a complex chain of prerequisites. For example, you won't see Interior Enhancements quests for the Mead Hall until after you've completed the corresponding Outdoor Enhancements quests. Every quest improves the appearance of Hytbold, but a few of them phase in objects or NPCs with special functionality. Those functional upgrades are indicated in gold below. Completing these rebuilding quests will also advance deeds for your character. The deeds help you keep track of your rebuilding efforts, and completing them also unlocks some Rohan housing decorations sold by Rinwald outside the Mead Hall. Deeds are colored green in this list. Edgal outside the Mead Hall offers 18 quests that require no reputation. NPCs from each of the four ridings of Eastern Rohan offer an additional 18 quests each at Ally and Kindred standing with their factions. You won't see these other quest bestowers until your standing is high enough with their respective factions. If you complete all 162 rebuilding quests, you'll have the opportunity to experience the culmination of Eastern Rohan's story. After completing an instance, you'll earn two titles: "Thane of Hytbold" and "Thane of the Eastemnet". If you continue on to solve a puzzling mystery, you will notice that barter vendors for all the other classes phase in around the Mead Hall. You can now barter for armour for your alts (it's bound to your account) and place it in shared storage. Be careful when bartering for armour. The items are not unique, so clicking the barter button twice will give you two of the same item. This quest has House of the Wold: Rebuild, House of the Wold: Enhancements I, Cottage of the Wold: Rebuild, and Cottage of the Wold: Enhancements I as additional prerequisites. Completing this quest also unlocks the quest Townsfolk III. Last edited by Fredelas; Feb 04 2017 at 07:33 PM. As you rebuild Hytbold, you'll notice that three of the buildings come with a special bonus. They phase in crafting resource instances. These are special solo-only quest areas where players with a gathering profession can collect a large amount of resources. Even if you don't have a gathering profession, you can still do the quests in each instance. Rebuilding the Lumber-mill and its Superior Workbench unlocks the forester resource instance, Imping. Rebuilding the Library and its Superior Study unlocks the scholar resource instance, Parphád. Rebuilding the Smithy and its Superior Forge unlocks the prospector resource instance, Iserngraf. The quest bestowers and the entrance to the instances are at the top of the hill behind the Mead Hall in Hytbold, on the east end of town. Each resource instance has three daily quests: a quest to defeat a signature enemy (the leader) in the instance, a quest to defeat 20 invaders in the instance, and a quest to collect 8 items from the instance (which may be dropped from enemies or found on the ground). Completing each quest gives you a [Token of Effort]. The quest for the leader also gives a choice of rewards related to Legendary Items. When you accept the first quest to defeat the leader, a one-hour timer will begin. The remaining two quests will automatically bestow when you enter the instance via the nearby horse, Gangfinda. If you don't finish these quests within an hour, they will fail. The type of foes you'll find in each instance changes every day. This can be very helpful in completing slayer deeds. The resource nodes in each instance also respawn daily. Your [Tokens of Effort] can be exchanged for additional crates of crafting resources, IXP runes, relics, or trade them for [Silver Tokens of the Riddermark] on a 3 : 1 basis. You can also barter them for single-use crafting recipes that make epic-quality gear. Ethelbryt bestows the quest for Imping, a lumber mill and processing facility that has been overrun. Rewards a specific tier 5 relic or an IXP rune. Ascbert bestows the quest for Parphád, an underground archive filled with enemies. Rewards a legendary weapon title or a fused tier 5 relic. Frithnoth bestows the quest for Iserngraf, a dark and dangerous mine. Rewards [Compendium of Middle Earth: Volume IV], a specific tier 5 relic, or an IXP rune. Last edited by Fredelas; Feb 04 2017 at 06:48 PM. In addition to his quest bestowing duties in front of the Mead Hall, Rinwald also offers 83 interesting housing decorations for barter. Each item costs [5 Tokens of Hytbold]. Some large furniture decorations may be objects you'd expect to be large wall items. Some may be missing textures on their backs. The double windows may not attach properly to walls. Chandeliers may display as a chain going from the ceiling through the floor. There are two decorations named Rohan Bench, with different appearances. The barter profile in the drop-down list at the top for these items may be named differently than the actual deed. You won't be able to barter for these decorations until you've completed a specific rebuilding deed, listed in green below. Last edited by Fredelas; Feb 04 2017 at 06:26 PM. The appearance of these sets may change in a future patch. According to the Known Issues at release: "Most of the Rohan Medium and Heavy endgame sets have mismatched default colors". Last edited by Fredelas; Feb 04 2017 at 07:58 PM. Last edited by Fredelas; Feb 04 2017 at 08:36 PM. Last edited by Fredelas; Feb 04 2017 at 08:03 PM. Last edited by Fredelas; Feb 04 2017 at 08:10 PM. Last edited by Fredelas; Feb 04 2017 at 08:19 PM. Last edited by Fredelas; Feb 04 2017 at 08:32 PM. Last edited by Fredelas; Feb 04 2017 at 08:41 PM. Last edited by Fredelas; Feb 04 2017 at 09:07 PM. Last edited by Fredelas; Feb 04 2017 at 09:11 PM. An incredibly detailed and very helpful guide, this is going to take away a lot of the confusion that comes along with the rebuilding of Hytbold. Thanks a lot Fredelas, very nice work! Thank you for finally posting this awesome guide which was leading us through Beta! Since some people asked me, I am posting here a spreadsheet with all the Hytbold upgrades and class gear sets. These tables might be useful for those who want to mix-and-match different pieces. If anyone wants to see more details in this spreadsheet or notices any mistakes, please let me know. Last edited by Lunasa; Oct 14 2012 at 03:32 PM. Excellent Guide and kudos for posting. I think Fredelas refers to an easy tactics (though not the only one). The active skill button depends on your speed, not on your distance from the Banner. The faster you go, the higher is the chance that you will miss the shield. There is also a timer for how long this extra quickbar is active. If you move too slow, the quickbar will disappear before you reach the banner. One of the easy tactics is to ride fast, then stop completely (or at least slow down) when you are very close to the banner, wait until the 'slow movement button' becomes active and hit the banner. In this way you increase the hit chance dramatically. You do daily quests just for tokens and rep with specific factions. The tokens are used to complete the rebuilding quests. Or do the rebuilding quests require tokens plus finishing a quest? And the reputation level in parenthesis before the armour piece is the level at which that particular quest opens up, or the level at which you can barter for the armour? Or both? Also, is there a thread that contains images and/or stats for all the armour sets? And the reputation level in parenthesis before the armour piece is the level at which that particular quest opens up, Yes, or the level at which you can barter for the armour? Not directly, but you only need to complete the quest in order to barter for the armour. And the quest itself requires reputation Or both? I am sure Fredelas soon will add screenshots of Hytbold gear. Meanwhile you can check my spreadsheet. It does not include the Etten gear yet, but all Hytbold sets are mentioned. Last edited by Lunasa; Oct 16 2012 at 06:30 AM. The Lorebook gods have answered my prayers and started adding Riders of Rohan data. I'm in the process of adding Lorebook links (just click on a set's name) for tooltips and pictures. I do not plan to link all the individual items, quests, and deeds, since it would become almost impossible to safely click anywhere on this page otherwise. Edit: I'm done adding Lorebook links. You should see pictures of the armour sets on those pages shortly. Last edited by Fredelas; Oct 14 2012 at 03:38 PM. Does anyone think it would be helpful to include small previews of the armour set appearances in this guide? I wanted to stay away from using images (except for the map) since it's already a huge thread, but it might help players identify what they're looking for quicker. Should we use reputation accelerators ? If so, for which factions ?